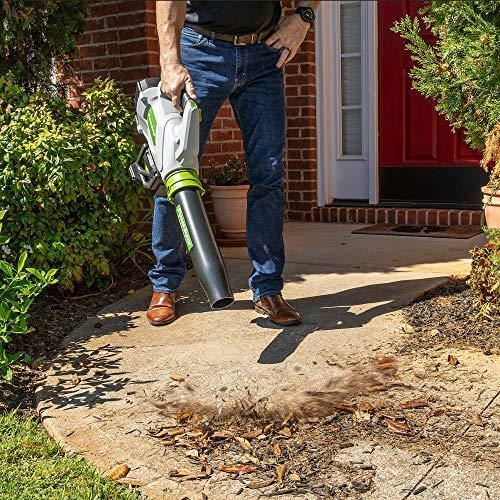 Having a lightweight battery powered leaf blower for your house or even an apartment is a great tool for quick cleanup of smaller areas with leaves grass clippings and other debris. Benefits to having a battery powered leaf blower is that they’re very easy to use, they’re very lightweight, and generally not that expensive. Another nice thing, depending on the model you buy, is the batteries will most likely interchange with your current battery powered tool systems such as cordless drills and saws. Not having a cord attached to the blower gives you the freedom to do jobs all around your property in a much quicker time and much easier then with a corded leaf blower. It’s also nice not having to buy gas and fuel mixture, because as long as you have a battery charged you’re ready to blow. These are my picks for the b cordless leaf blowers that you can easily pick up on Amazon.com and lots of other websites. First off I’m a big fan of all DeWalt products. Nearly all of the tools in my shop are DeWalt with the exception of maybe one or two. Their current 20 volt battery system is definitely one of the best on the market. With that said, I was very excited to try out this DeWalt cordless leaf blower and see how performed against other brands in its class. My first impression of the DeWalt dcbl720 P1 was how much power it had when you first pull the trigger. The axial fan design definitely maximizes the air output, as well as the run time. The brushless motor is also great because it will extend the life of the motor. I really like the Speed Lock feature that will keep the variable speed trigger. You can set it exactly where you want it so you don’t have to hold the trigger down the entire time you’re using the blower. This DeWalt is very lightweight even with the battery inserted. It’s so light at 7lbs even my kids can use it, which is nice because they couldn’t use my old gas powered leaf blower. So now I can put them to work in the backyard. 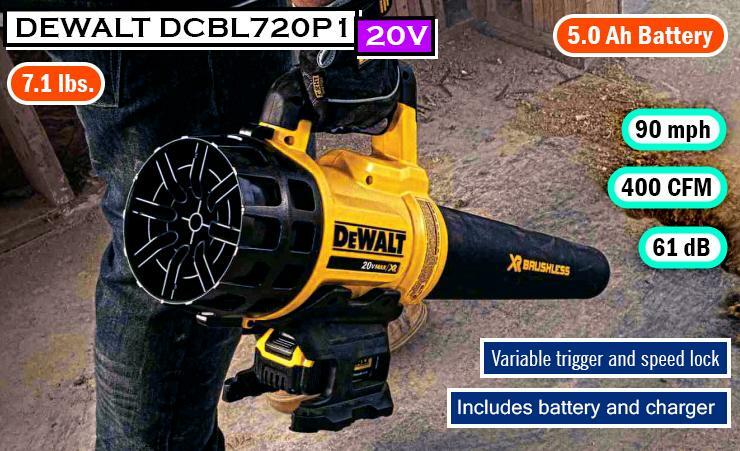 I got about 25 minutes of constant blowing time with this DeWalt which is pretty good in my mind and will let me clean up just about any jobs I have in the backyard without having to change batteries. The noise level with this blower is not unreasonable. With my old gas blower I always felt bad for the neighbors because it was so loud. 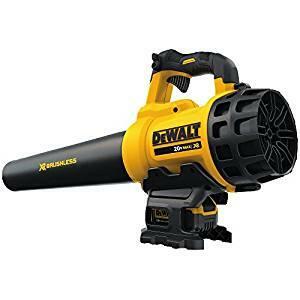 However this DeWalt blower is relatively quiet by comparison. This DeWalt model is definitely one of my top picks and one you should put on your short list to consider. To be honest I haven’t owned a lot of Milwaukee products in the past. I’ve always been a DeWalt and Porter Cable Guy. 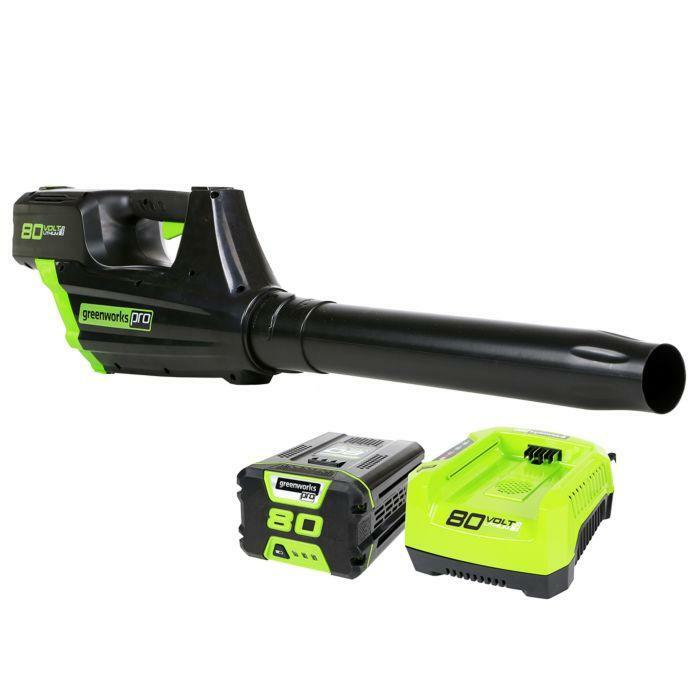 But I have to say I’m definitely impressed with this Milwaukee 18 volt cordless leaf blower. The first thing I noticed is that it’s extremely quiet. Probably a bit quieter than the DeWalt actually. It’s rated at 63db, which is about 30% less than most gas leaf blowers. You can tell when you pick it up at the construction is very solid. It’s a little bit heavier than the DeWalt, but not by much. The M18 fuel blower has enough power to blow leaves and debris from almost 15 feet. 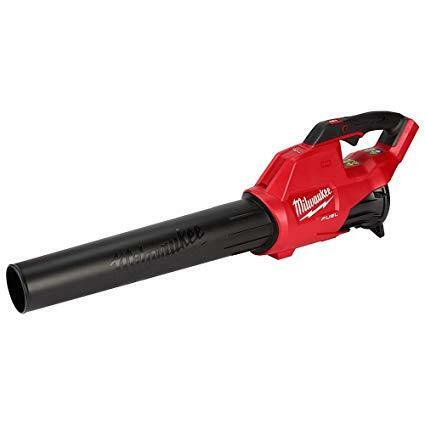 If you’re used to a gas powered leaf blower like a Stihl or Echo, you’re not going to be disappointed with the volume of air that this Milwaukee produces. With the big 18 volt battery, you can get 40 to 45 minutes of continuous run time. For me this is plenty to clean up after any lawn mowing or yard work job. One nice feature that I really liked is the ambidextrous speed control which allows the blower to be set at a fixed power so you can relax your operating hand. I found that running the Milwaukee blower at about 80% power produced the best results. At full power this leaf blower scatters leaves and debris everywhere. I recommend keeping it about 75 to 80% for better control. The Milwaukee is definitely more of an industrial/commercial style blower. However it’s still perfect for residential use and while it’s a little more expensive then some of the other blowers and its class you will definitely notice the difference in construction quality and power. 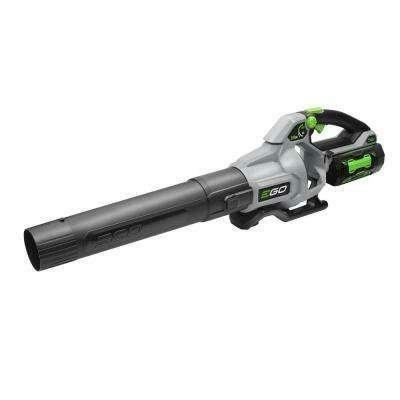 So on to our next leaf blower we have the Greenworks gbl80300 cordless leaf blower. I’ve tested some of the Greenworks products here on YardMasterz.com. Most recently one of their battery-powered lawn mowers. I have to say I was extremely impressed with the quality and performance of that mower so I was looking forward to testing out this cordless leaf blower to see if it lived up to the quality of their other products. 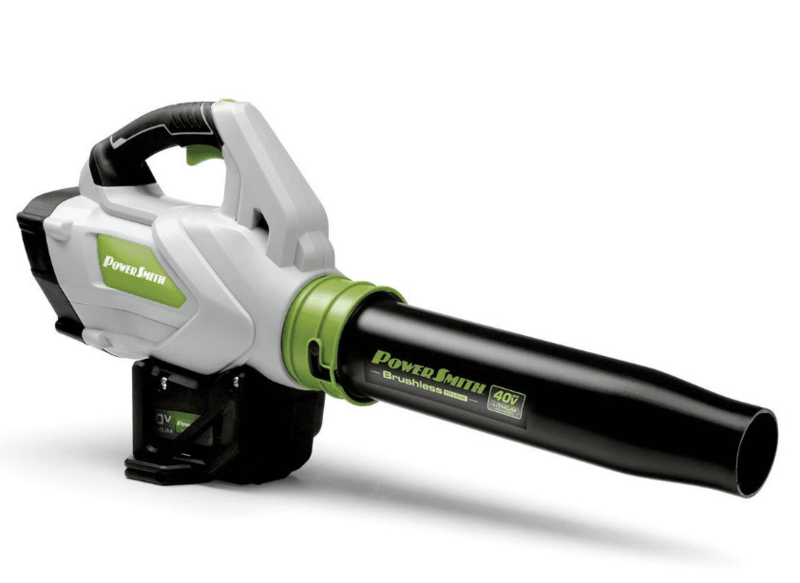 First, I really like the sleek-looking design of this Greenworks blower. It just looks pleasing to the eye before you even use it. This model also has a brushless motor which extends the life of the product and delivers performance close to a 32cc gas engine. The blowing power is about 500 CFM at 125 mph. You can blow dry grass and leaves as well as wet debris with absolutely no problem at all. The push button start on this model is somewhat unique. haven’t seen this feature in any of the other blowers I tested. I managed to get about one hour of run time of continuous use using the fully charged 2ah battery that comes with this blower package. Like the other blowers I tested, the Greenworks was very quiet. I wouldn’t hesitate to use this leaf blower in the morning as I doubt the neighbors would even hear it if their doors and windows are closed. Another nice feature is that this battery system works with over 20 other Greenworks products. So if you own several, you only need one battery system for all of them. With the cost of the batteries, it’s nice to know you only need to have a couple on hand for all of your tools. Just because Greenworks is a relatively new kid on the block for yard and power tools, don’t let that fool you into thinking they can’t compete with the old players. They’re making high quality products that are equally good for residential and professional use.All of this at a price point that won’t break the bank for most homeowners. Add the Greenworks gbl80300 to your shortlist of battery powered leaf blowers to consider. So prior to putting together this review I hadn’t heard of the Powersmith brand for battery-powered lawn care equipment. 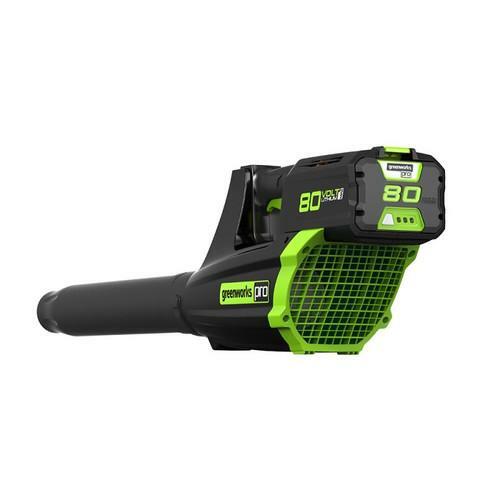 However, after looking at some of the products they have on Amazon and their customer reviews I was pleasantly surprised and decided to add this particular battery powered leaf blower to my top 5 list. When the Powersmith blower arrived and I got to try it out for the first time the feel of it was very similar to the DeWalt blower. 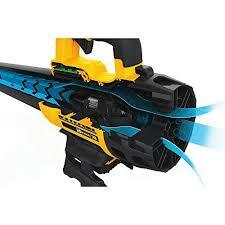 In fact the look is also very similar to the DeWalt blower. Immediately, I like the power output of this blower. This model is rated at 120 mph/450 CFM, and it definitely generates a good amount of wind with a fully charged battery. Again, like the other models, this unit has a brushless motor for a longer run time more power and more torque than brushed motors. In the end this just means less wear and tear on the blower and you’ll get more life out of it. After using the Powersmith a few times I started to realize how much lighter it actually is than the other blowers I tested. This is a great blower for older folks and even senior citizens who just want to blow off driveways and patios with some quick use. But even if you are a homeowner who needs to do some serious leaf or lawn clippings blowing, there’s no reason the Powersmith can’t handle the job with it’s large CFM output. The one downside with this leaf blower is that I only got about 20 minutes of trigger time. So I would definitely suggest ordering a second battery if you decide to purchase this particular blower. It does come with a single 40 V battery and charger but a backup battery is recommended. Last but certainly not least on my list of the top 5 cordless leaf blowers for 2018 is the EGO 168 mph variable speed blower. 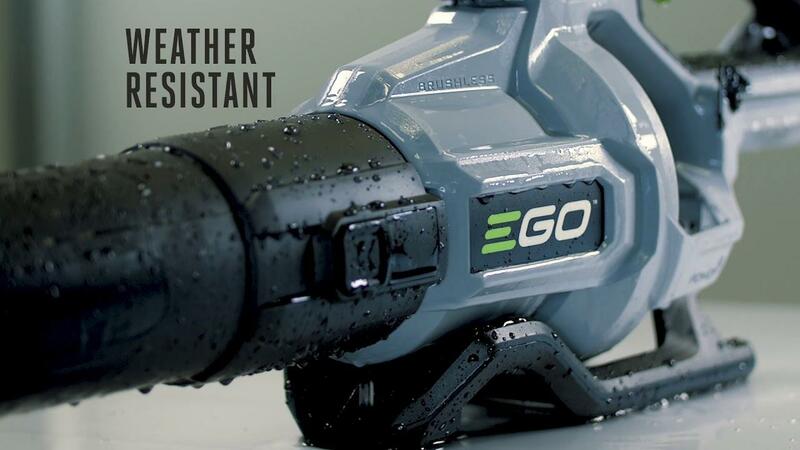 this new EGO blower is one of the most powerful handheld blowers on the market delivering up to 580 CFM with its unique turbine fan brushless motor. The design of this blower is very sleek and lightweight. One of the best features is the tapered nozzle attachments which make clearing debris super easy. You’re probably not going to find this particular EGO model in most of the big box stores. This high-powered model I’ve only been able to find online. 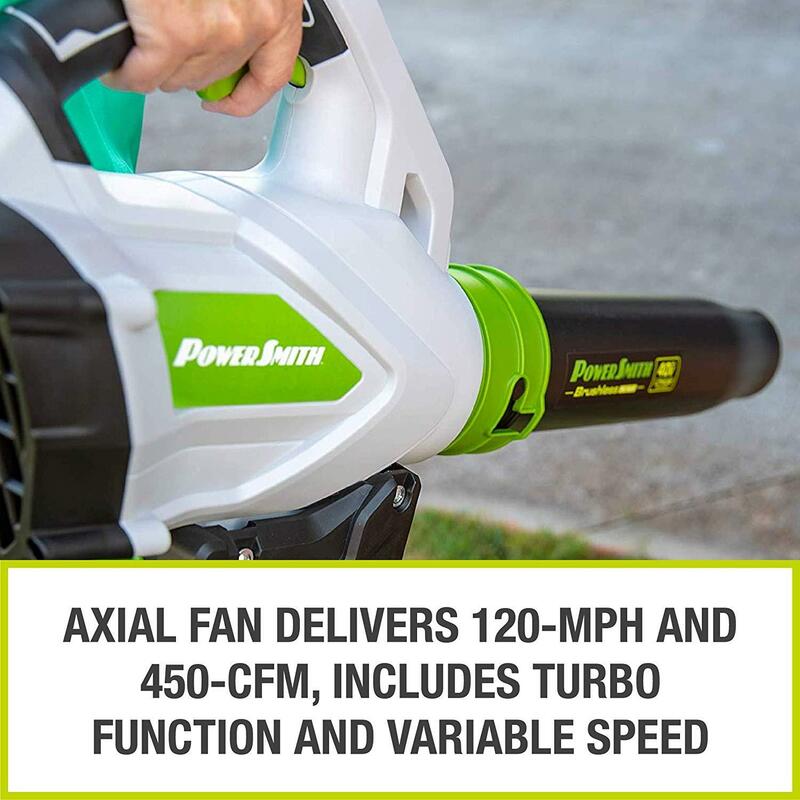 When I tested this blower for the first time the battery was only partially charged yet I was still able to clear away my back patio of leaves in just a couple of minutes. The power this model produces is really unbelievable. And if that wasn’t enough it has a “boost” button to give you an even bigger blast of air. Now I haven’t tested this personally, but according to the manufacturer you can get up to 3 hours of runtime on this blower when you use the efficiency mode. The batteries do take a while to charge. Up to 90 minutes for the larger battery, but while the battery is charging there’s a fan that kicks on to keep the battery from overheating which is a great feature. Yes the price tag is a little higher than some of the other EGO models, but you definitely get more bang for your buck with this unit. I’m guessing that even some professional gas powered blowers don’t have as much power as this 56-volt EGO blower does. If you don’t believe me just check out the reviews on Amazon as well. Everyone who’s purchase this particular blower has been shocked with the amount of power it has. 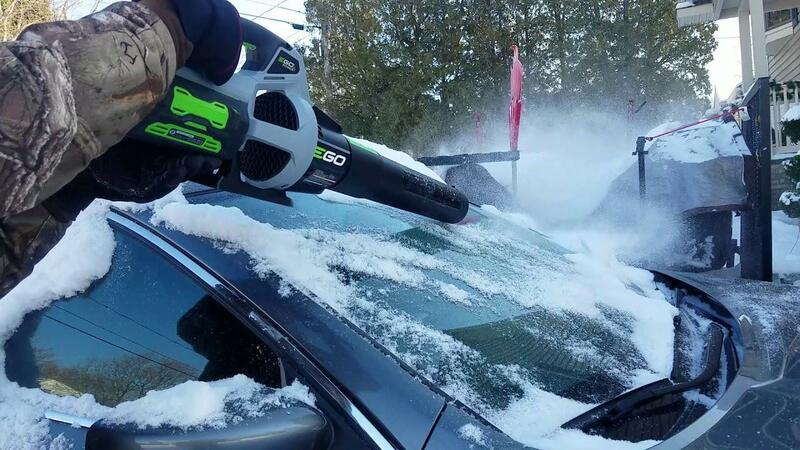 Get this EGO and your neighbors are going to have blower envy..big time! 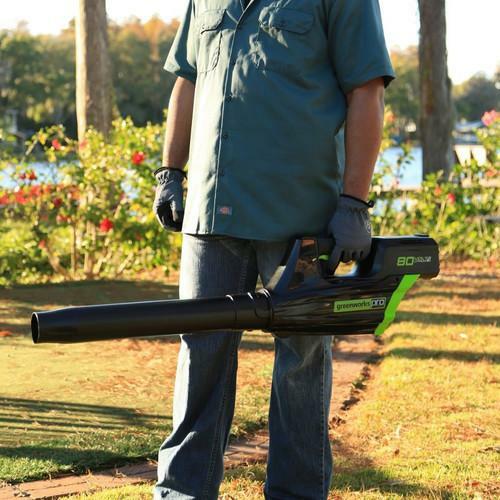 Choosing the right cordless leaf blower for your particular needs shouldn’t be a complicated decision. yes there are quite a few makes and models on the market with varying price tags, but in the end nearly all of them have similar features. Here are just a few things you should consider before making your lower purchase. You’ll probably want to do is figure out how much you want to spend and next decide how much blowing you’re actually going to do. Personally, I have about a 1 acre yard with lots of trees, bushes, planters and obviously lawn.For my situation, a leaf blower with about 40 minutes of continuous run time is what I need to complete the jobs around my property. But if you just have a small patio and a driveway that you want to keep clean you can definitely choose a model with a little less power and a little shorter battery life. This will lower the cost and save you a few bucks. When looking at the performance of a battery leaf blower you definitely want to keep an eye out on the mph and CFM numbers. Both of these determine the volume and speed of air exiting the blower tube. Mph means miles per hour and CFM means cubic feet per minute. The higher the numbers on the particular model you’re looking at the more air the motor won’t push through the tube. Obviously you can blow heavier debris with a blower that has more power. If you live in an area with an h o a, there may be regulations on how much noise your yard equipment is allowed to produce.With the association before purchasing a leaf blower just to make sure you’re within HOA rules. With cordless leaf blowers being considerably more quiet than gas-powered blowers, I highly doubt you’ll have any complaints from your neighbors while blowing off your back patio. most of these blowers are rated around the 60 decibel range.Anything under 80 decibels is definitely a neighbor friendly blower. This is definitely worth looking at on the model you’re considering purchasing. The blower models I tested here had battery voltage ranging from 18 volts up to 80 volts. Generally speaking, the higher the battery voltage the longer the charge and blower run time will be. You will definitely pay more for an 80 volt battery blower versus a 20 volt battery blower. Depending on your needs you may just want to find a cordless leaf blower with a battery voltage somewhere in the middle. another thing to consider when it comes to batteries is your existing power tools. If you can purchase a blower that runs on the same battery system as your cordless drill and saws, he will likely already have some backup batteries at your disposal.